What's not to love about that texture? It looks like snails trails, doesn't it? Totally in keeping with the "Fairy Ring" theme of this kaleidoscope. This is for a great niece, Meggie. We just received their Annual Christmas Letter, along with photos, and by gosh, that little girl is growing too fast -- I had better get this project done and in the mail! Quilt dimensions are about 70 x 70 inches, and little Meggie WAS 3 1/2 when she asked for it last July! Halleluja - don't have to cook tonight (leftovers, yum!) and I can work on this project several times today. I'm being careful to do exercises between short machine quilting periods. Labels: Fairy Rings, kaleidoscope quilt, Meggie's quilt. I really admire your quilting skills. I wish I was closer to you so I could watch! Could you do your "fan base" a video??????? Subee in snowy Indiana who has not been able to sew for 3 days and is going into deep depression. I just rewatched the 'Pajama Quilter Reloaded' since I am going to be doing a bit of FM myself. This fairy quilt is looking good. I LOVE the quilting! 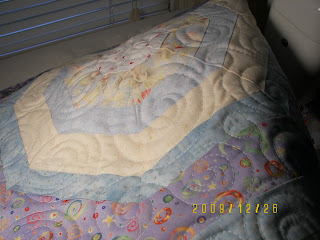 I am a huge fan of free motion swirls myself, yours are amazing and really do complete the quilt!!!! I love the quilting! 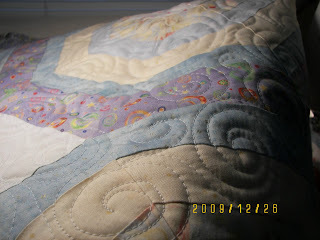 I am always glad to see your posts because you do your own quilting. It's such an inspiration to continue to try to do it myself. I look forward to reading your blog! Dear hubby got me four free motion quilting instruction videos for Christmas so I will be knuckling down and learning how to do these beautiful things. Of course, it will be quite a while before I can approach your work! But as soon as I get a foundation pieced picture completed for a gift, I'll be off! Your quilting is a nice addition to the quilt. Your fairy quilt is darling. The quilting is great. I am sure Meggie will be quite pleased with it. Oh, soft and swirly. I loved it the moment your blog opened. Thanks for the encouragement to do quilting on my DSM. Now that I am retired, I plan to spend some time watching Patsy's video some more and practice. I do love your swirls! Your example is a good one to follow and has encouraged me before & I'm sure will in the future. Beautiful quilting! My favorite kind of design!